There are many important considerations for international students when deciding where to study math in the U.S. Students should try find out about the climate conditions, local activities, and cultural representation in the cities in which they will study. These aspects of studying math can make an impact on a student's educational experience. International students interested in studying mathematics should carefully consider many different factors when choosing the best place to study in the US. Many international students often evaluate the prestige of the school and its math department, however prestige is not the only thing that matters. Consider, for example, the location and the environment. What is the climate like in the region? What do people do for fun? How approachable is the faculty? Studying is very important, but having a life balance can certainly translate into a successful academic year. Here are some considerations to keep in mind. The U.S. is geographically large and there is a lot of variation in climate and topographical features among various regions. These differences might be important to some students in deciding to where to study math. Some regions experience hot summers but cold winters, some are warm all year round, and others are dry, and so on. Some leading universities are located near mountains or oceans, while others are landlocked or surrounded by plains. If these considerations are important to you, then you should be sure to look into these sorts of conditions. Typically there top math schools available in just about every geographic region in the U.S. Top schools in math can be found in warm and sunny Florida, cloudy but temperate Oregon, and in the hot in the summer, cold in the winter states in the Northeast, such as New York. Visit the Study in the USA School search to find schools that offer programs of study in Mathematics. Every region in the U.S. offers fun things to do, but depending on your interests, some regions might suit you more than others. It is important to keep in mind that the U.S. is quite large, and so traveling long distances often requires expensive transportation, such as airline flights or long bus trips. You will want to find a region that suits you well when deciding where to study math, since that will be where you spend most of your time. You should also look into a place to study which matches yours personal preferences for fun activities. There are always exceptions, but as a general rule, large cities will more often have a variety of cultural attractions, while smaller cities will offer more in the way of outdoor activities. International students who are interested in ballet, opera, museums, and so on might prefer larger cities. Those who prefer easy access to forest trails or hiking and climbing might prefer smaller cities. There are also on campus activities that can add to a student's educational experience. Students can participate in clubs and sports leagues. Some will even have math or computer science clubs which provide fun ways to study math with others. International students who come to study math in the U.S. might find that traditions and customs are very different from their home countries. Depending upon your personality and what you are looking for your experience of the U.S., you might prefer to study in universities in places where you can find elements of your familiar culture. Students should look into the universities they live in and the cities in which these universities are located to find out which cultures are represented. In big cities, such as New York City or Los Angeles, one will typically be able to find areas where one's culture is represented, but this might not be true for smaller cities. For instance, Felician College	in New Jersey gives international students the proximity to get an internship in New York City at some of the top corporations in the world. Students studying mathematics will learn about mathematical theory, computational techniques, algorithms, and the latest computer technology. During their summer, they will then get to apply their classroom training in major corporations involved in economics, science, engineering, and business. 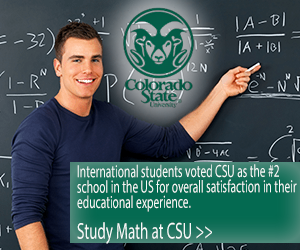 Some top math schools will be very accommodating to many different cultures. Students should inquire into prospective departments to see what policies they have in place to make sure international students feel welcome and comfortable. Learn more about studying mathematics in the USA by reading our growing article collection. « Study Guide by Subject	« Study Mathematics in the U.S.
Over time we will be updating this section and including more information for those who want to study mathematics in the USA and for other countries, but please feel free to post your thoughts and comments on our Facebook fan page, and also follow us and post questions through Twitter.